This workshop is organised by the Dynamical Systems and Geometry group at Universität Bremen (Germany). The topics of the conference include Multifractal Analysis, Thermodynamic Formalism, Number Theory (β-transformations) and Hyperbolic Geometry. A poster for the workshop is available here. 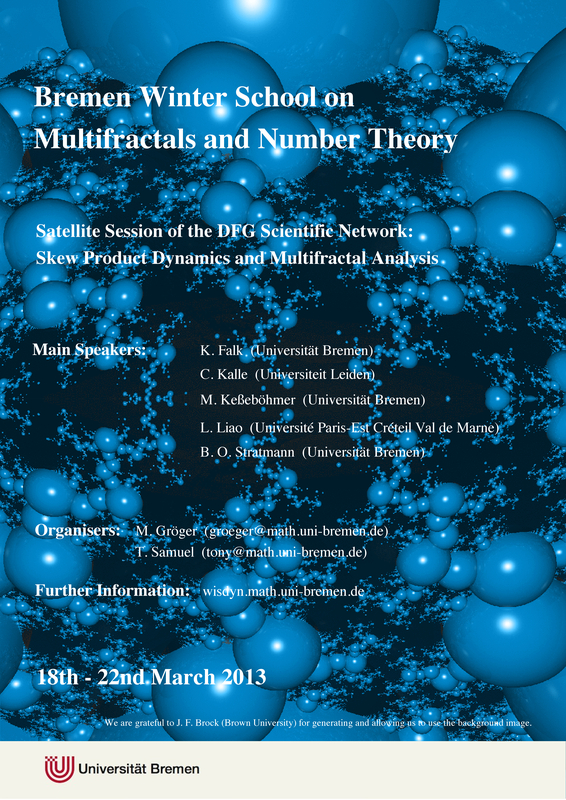 This winter school is part of the activities of the Scientific Network - Skew Product Dynamics and Multifractal Analysis. To register for this winter school please email one of the organisers, see below. The deadline for registration is 15th February 2013. To register for this winter school please email one of the organisers. The deadline for registration is 15th February 2013.